One of the cool things about my job is that I am constantly finding new craft books that are just so cool. Sadly no-one else here in the office shares my love of all things craft so I have no-one here that will get all excited with me about the great craft books we get. So you, dear readers, are who I share my love of crafts with. Another cool thing is that one of our publishers sends a regular round-up of all publicity recieved for their books on the web. For me this is a great opportunity to discover new craft blogs. One that I discovered last week is by Betz White, an author, designer and green crafter. She shares some pretty cool ideas and projects on her blog, and also reviews notable craft books. She has written a review of one of the new Lark Books, Awareknits, by Vickie Howell and Adrienne Armstrong (ISBN: 9781600594694). This is a pretty cool book by a well-known knitter/author and I highly reccomend you read Betz White's review here. 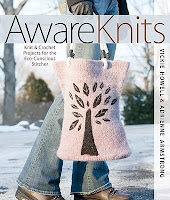 If you'd like to become a more 'aware' knitter then this book is for you. You can grab a copy from Booktopia here.